Elwyn is a name on the verge of extinction. Can it be revived in the twenty-first century? 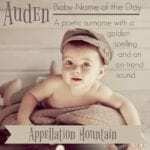 Thanks to Alli for suggesting her father’s name as our Baby Name of the Day. Ealdwine was an Old English name, from the elements eald – old – and wine – friend. While you’ve probably never heard of Ealdwine, the pieces of the name survive in Aldo and Edwin. Alvin is the most common modern form of Ealdwine. At some point Ealdwine became Elwyn. And Elwyn became a sometimes-heard surname. A seventh century Bishop of Lindsey was known as Ethelwine or Elwin. He’s mentioned in Bede’s Ecclesiastical History of the English People as a saint, though we don’t know much about his life. During the 1700s and 1800s, there were revivals of Anglo Saxon favorites like Alfred and Edith. Alvin, too, rose from obscurity. By 1880, the first year the US Social Security Administration reported name data, Alvin was the 131st most popular name for boys. 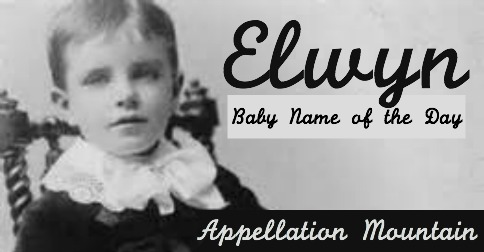 Fewer than five babies were named Elwin or Elwyn. Both spellings of the name slowly started to creep up in use. You’ve probably heard of one Elwyn – though you don’t know it. 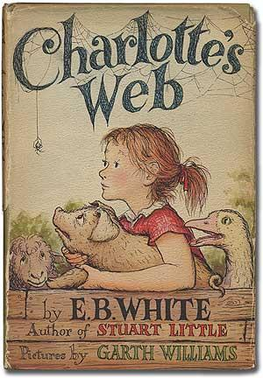 Elwyn Brooks White, the author of Stuart Little, Charlotte’s Web and co-author of The Elements of Style is almost always referred to by his initials: EB White. White was born in 1899, one of seven boys given the name that year. 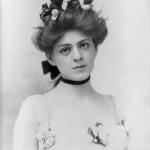 Elwyn hugged the edges of the US Top 1000 in the late nineteenth and early twentieth centuries, and was ranked every year from 1912 through 1939. Elwin fared even better, charting in the Top 1000 from 1897 through 1945, and well as several years before and after. Other notables include a Louisiana politician, a British writer, a paleontologist, and a judge. The -wyn spelling peaked in 1924, when 104 boys were given the name. The -win spelling rose slightly higher, given to 145 boys in 1926. All of this surprised me, because I expected the name to be Welsh. Names ending in -wen, like Bronwen, Olwen, and Arianwen, are feminine names in Welsh. Wyn names, like Cledwyn and Dilwyn are masculine. So a -wyn ending name often signals a traditional Welsh name for a boy. That’s not the case here, though – at least not most of the time. I did find a handful of uses in Wales, and British Baby Names includes it on their list of Clunky Celtic names, along with gems like Colwyn and Islwyn. Americans often prefer to reserve ‘y’ spellings for girls, and so Bronwyn and Olwyn have been seen in the US. Alvin sounds masculine, and broadly familiar thanks to many a famous bearer. Besides the chipmunk, there’s dancer Alvin Ailey, writer Alvin Toffler, and a handful of athletes. But Elwyn leans feminine, a spin on traditional Ellen and an alternative to all of the El- names that are so popular today. 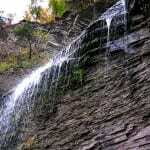 The -wyn brings to mind the -lyn of Evelyn, Brooklyn, and Madelyn, as well as Gwyneth. And, as Alli pointed out when she requested this name, the nickname Winnie works well with Elwyn. While the numbers tend to give this one to the boys, it’s not unknown for girls – at least until recently. Because this name is truly on the edge of extinction. Fewer than five children have been named Elwyn in any given year since 2011. 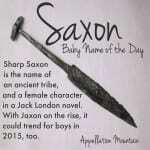 For three decades prior, only a handful of children were given the name. Elwyn is rare, but perfectly wearable in our age of two-syllable, ends-in-n names. But it might be more tempting for a daughter than a son today. What do you think of Elywn? Is it better for a boy or a girl? 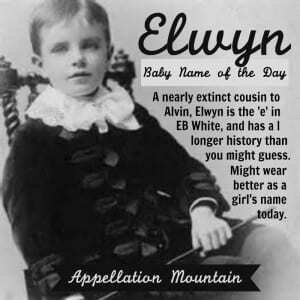 My son is called Elwyn, I thought it was welsh for fair of face but seems as though I have been wrong all these years. Most Elwyn’s you come across are over 75 but my son is 22 and keeping the name alive. My Grandfather and Great Grandfather were both Elwyn Lemuel. My Grandfather passed away two months before my first daughter was born and we named her Elwyn Louise in memory of him. How lovely that you were able to keep the name in the family, Paige! It sounds like a girl’s name to me. It sounds like it could come from Lord of the Rings. I have known too many men with this name. So in no way possible , through my experiences, could I identify it as a female name. With that said, it was featured on a little boy in the Murdoch murder mystery series that takes place in 1889 and progress forward. I think its the episode with man-made robots in season 1. I think the name is soft like Edwin, Edmond or Ralf/Rolf. It isn’t harsh sounding or spelled in a funny way that is outside our norm, allowing parents to use the name to honor family heritage, without going to the extremes with names like Aguiluf, Cynewulf , Ceolwulf, Cnute, Etheldred, or Otto. Which all have harsh sounds or annunciation issues. By the way, I knew the name was German in origen, it had never crossed my mind as being Welsh in origen until now. And I think it *could* be a modern construction from Welsh elements, like ‘elus’ or ‘elain’ + ‘wyn’, but it probably doesn’t have documented usage in that way.